The Medieval Wall and Fortifications in Tallinn is one of the best examples of medieval architecture in the world. In the 13th century the crusading knights of the Teutonic Order built a castle which became a developing and major center of the Hanseatic League. Its wealth was clearly seen in the magnificence of the public buildings and the remarkable architecture of the merchant’s houses, which have made it through the time despite the ravages of fire and the war. Tallinn was once the greatest fortified city in whole of Europe. 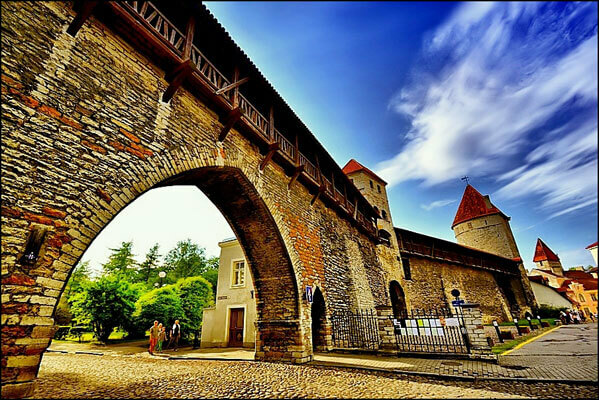 Today you can still see many magnificent defense towers and historic gates. These absolutely beautiful and unique constructions are a perfect example of the medieval architecture of Tallinn. However, all the credit still goes to Tallinn city’s defense wall! Tallinn city wall became one of the largest and strongest defense systems in the entire Northern Europe. The oldest parts of this wall were built in the 13th century. The construction first began in 1265 under the orders of Margaret Sambiria (queen and spouse of Christopher I of Denmark), whose name was given to one of the towers – Stout Margaret (mostly known as Fat Margaret). In the 16th century the wall was about 2.4 kilometres long and had 46 towers incorporated along its length. Today around 1.85 km of the wall, including 26 of the defensive towers and 4 gateways, still stand strong. Each tower has its own name. Even though the wall is damaged and did not keep its original length, it is still a monument which makes Tallinn really famous. It is an impressive sight whether viewed from above or close to. In some places you can even access the insides of the wall and climb up to the walkway above. The parts off the wall which are opened to the people connect Nunna, Sauna, and Kuldjala towers.